But then I had a baby and a breakdown our first summer in this house and no freezer or garden. A job and a 1 and 3 year old and a new-to-us freezer that originally belonged to John’s grandparents, but no extra produce and minimal time, the next summer. A bit more time last summer, but a dud of a garden bounty and just as I planned to buy the massive quantities of veggies and fruits at the farmer’s market, our freezer broke. This summer I have the time. Sort of the garden, at least enough cucumbers and tomatoes on the way to do a bit of something. But no extra freezer and a fear of real canning. But I’m doing what I can. So when I stopped at a market Saturday morning and saw a big basket of tomato seconds for $9.99 and bunches of peach seconds for different prices, I had to think. I had to decide how much realistic time I had that day and whether or not I could process a whole lot (to me) of tomatoes AND peaches in one day. 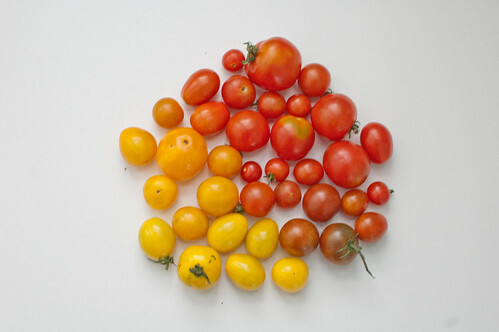 I decided it was too ambitious and I’d just get grumpy, so I went with the tomatoes and grabbed some smaller tomatoes to snack on and photograph for good measure. I roasted some garlic cloves (about two heads worth.) I got some water boiling. I got out the food processor after we searched the house high and low for the lost straining piece of our food mill that the kids play with more than any other toy in the house. I made an ice bath and got out an extra large bowl for skins and seeds. 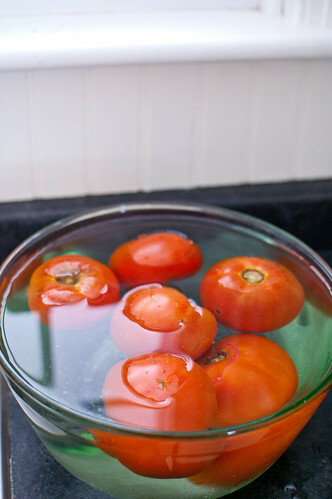 I got to work with plunging the tomatoes into the boiling water for a minute-ish, then putting them in the ice water bath. 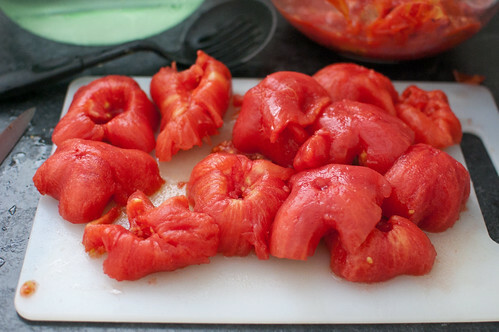 I pulled them out of the ice bath, cut out the core, peeled off the skins and squeezed the juices and seeds out, finishing with the squeezed tomatoes in the food processor. Over and over for the afternoon I did this until each time the food processor was full. I threw in a few cloves of the roasted garlic, then pulsed until it was almost smooth with a bit of chunk left for good measure. The kids walked in and out of the kitchen asking for water or a snack or to stand on the stool and watch and giggle as I squeezed the seeds out of the tomatoes. They left and walked to the park with John to see antique fire trucks and returned to me still with the tomatoes. Back and forth from the box of tomatoes to the stove to the counter to the food processor until I had worked my way through all of the tomatoes. I couldn’t help but think of the honesty of the work and how much I wished I could make even more if we had the room. But if I don’t can (because I’m afraid,) we don’t have a ton of room for freezer storage (our freezer is small.) Five quart jars and 4 pint jars of the crushed tomatoes later, they’re snuggly in our freezer waiting for a cool fall or winter day. A sauce will be made for pasta or a soup or casserole. We’ll probably use them faster than I anticipate. But we’ll enjoy them and appreciate them and isn’t that the point? I may not have a whole homestead rolling around my suburban home, but we surely try in little bits and pieces. We dream of chickens in the backyard and a backyard that backs up to the woods where kids can run and live childhood the way I imagine it in my head. 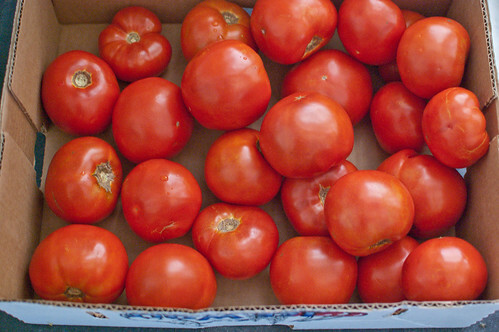 We buy cans of tomatoes at the store and jars of sauce, but we think of the slow changes we’ve made and it feels good. 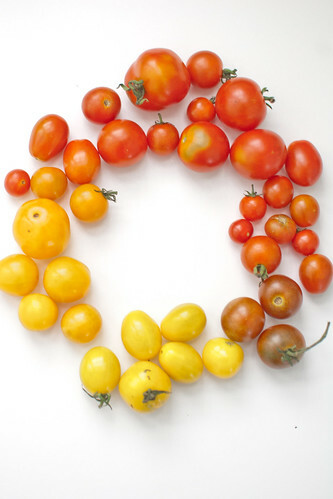 I think of all of the people who spent summers over a hot stove because there wasn’t any other choice – if they wanted to eat tomatoes, or other vegetables that couldn’t be stored in a root cellar in the cold months, they had to get working in the hot summer months of produce bounty. I’m learning constantly, getting ready and thinking of the potential for next year if we get a new freezer by the summer. 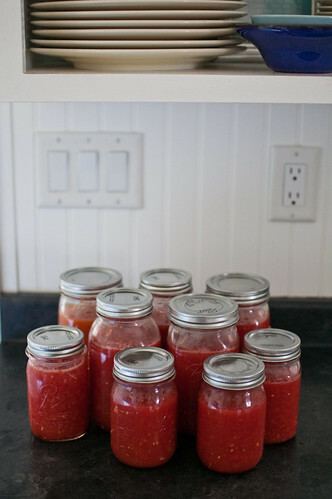 Contemplating attempting some canning if I can work up the nerve in the next few weeks. Thinking of inviting friends over for the canning party we discussed to make it a little more fun and a little less to get myself worked up over. We’ll see. If it doesn’t happen, I’ll still be happy with my snug tomatoes and my few freezer jam containers that will last a good while. I’m learning, slowly. What have you been working on learning recently? I’d love to know! Thanks Linda! Totally understand what you mean by wanting some space to breathe! 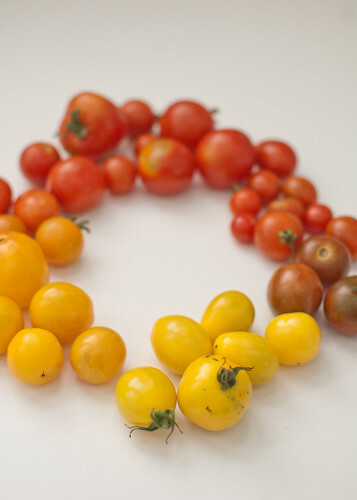 Beautiful tomato photos, Lillian!!! My new favorite super-easy, uncooked pizza sauce = a large can of crushed tomatoes (I used San Marzano b/c CO has crappy tomatoes), a few cloves of minced garlic, a few tablespoons of good olive oil, some chopped fresh basil, a tsp of dried thyme or marjoram, a pinch of sugar, and salt & pepper. 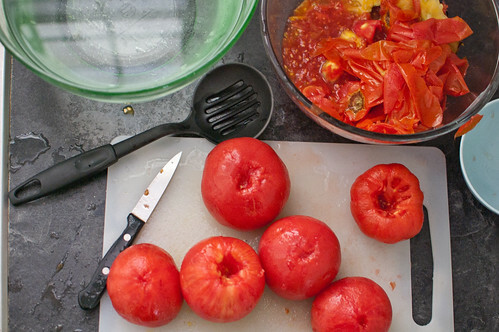 You might want to drain the tomatoes a bit. Puree (or even just stir together) all of the above and use immediately or store in the fridge for a few days. It’s amazing on grilled pizza, too! Throw in a splash of balsamic, crushed red pepper, etc., etc. You can’t screw it up. Yuuuuum! Definitely adding this to the easy recipe list! Your local Extension office will also be a tremendous resource for free information. Knowledge is the best way to overcome fear. I also recommend getting a “Home Canning Utensil Kit” from either Wal-Mart or Target. It contains a number of very helpful tools. I used to can about 300-400 qts of produce a year from our garden. Some of them are still good down in our basement on the farm after 20 years. 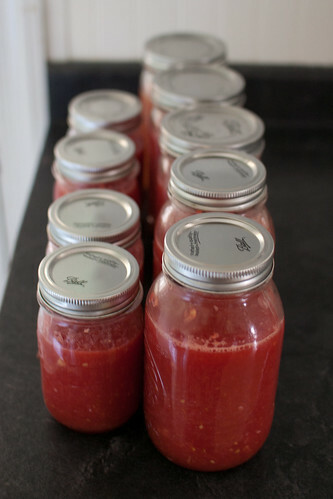 With all the work you are doing with tomatoes, canning will be a snap for you.